"Great eaten fresh from oven. Used to make sub sandwiches, etc." Place 1 cup water, bread flour, sugar, salt and yeast into bread machine pan in the order recommended by manufacturer. Select Dough cycle, and press Start. Punch down dough. On a lightly floured surface, roll into a 16x12 inch rectangle. Cut dough in half, creating two 8x12 inch rectangles. Roll up each half of dough tightly, beginning at 12 inch side, pounding out any air bubbles as you go. Roll gently back and forth to taper end. Place 3 inches apart on a greased cookie sheet. Make deep diagonal slashes across loaves every 2 inches, or make one lengthwise slash on each loaf. Cover, and let rise in a warm place for 30 to 40 minutes, or until doubled in bulk. 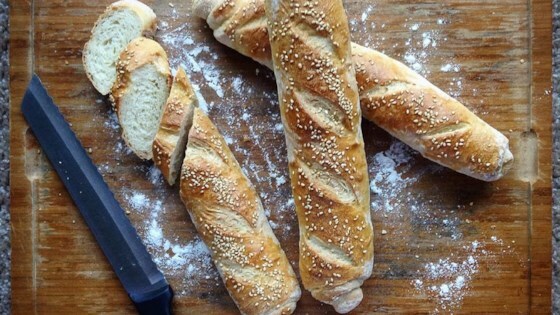 For tips, see our article on Forming and Baking Baguettes. Very nice tasting bread. It was a bit tough, but that may have been my fault. Excellent! Easy to make and roll out. The only thing I did differently is to brush egg whites on top instead of egg yolks...this gave a nice crunchy crust. Will definately make again! Too sticky. Needed to use 3 cups of flour. BUT, then this makes the BEST French bread ever. I do not roll out, just shape and bake. YUMMY! !